“ He who controls the past, commands the future. He who commands the future, conquers the past. Command & Conquer: Red Alert is a real-time strategy computer game of the Command & Conquer franchise, produced by Westwood Studios and released by Virgin Interactive in 1996. 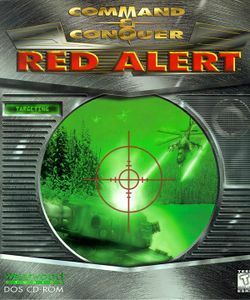 The second major game to bear the C&C title, Red Alert was originally meant to be the prequel to the original Command & Conquer of 1995, and takes place in the early history of the alternate universe of Command & Conquer when Allied Forces battle an aggressive Soviet Union for control over the European mainland. It was initially available for PC (MS-DOS & Windows 95 versions included in one package), and was subsequently ported to PlayStation. The PlayStation version was also re-released as a download on the PlayStation Network for PSP and PS3. On 31 August 2008, Electronic Arts officially rendered Command & Conquer: Red Alert freeware. Although its expansion packs, Counterstrike and The Aftermath, both released in 1997, did not get an official freeware release, they are de facto considered free to distribute as well, as none of the community-hosted mirrors of the expansion discs or repacks have been taken down since 2008. 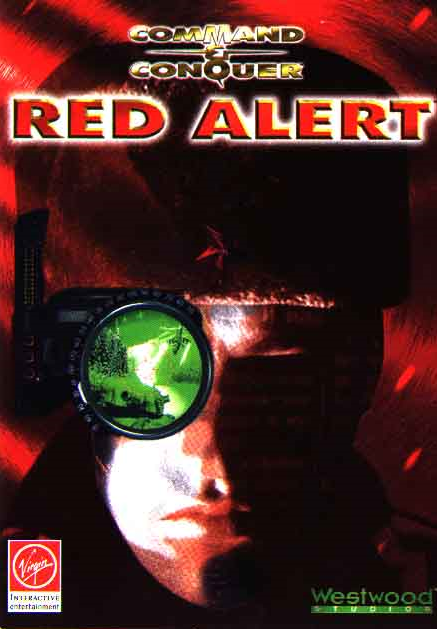 Red Alert was praised for its user interface, which claimed to be more developed than the competing games of its time. Players could queue commands, create unit groups that could be selected by a number key, and control numerous units at a time. The game was known to be easy to control, simple to learn and responsive to users' commands. It also featured two factions that had differing styles of play. Red Alert is also hailed as one of the first games to feature competitive online play. The single player campaign also received high praise for its detailed story line and missions, which often required the player to defeat the enemy with various sets of circumstances before continuing. The single player campaign was also complemented by live action cinematic sequences that are a feature of all Command & Conquer RTS games since the original, except for Generals. Players acquire credits to purchase structures and equipment by mining for ores and minerals (as the valuable, yet volatile Tiberium in the regular C&C series has not yet been discovered in this timeline). Rare gems generate more credits and are faster to mine, but unlike ores, do not regenerate within the map. Players can gain more credits and increase their buying power by building more ore refineries and ore trucks. The Soviets' vehicles tend to be more durable and powerful than Allied vehicles, but are often slower moving and more expensive. The Soviets also have superior defensive capabilities against both ground attacks (Tesla coil) and air attacks (Surface to Air Missiles), but are at a disadvantage on the sea. The only offensive naval unit the Soviets have is the submarine, which cannot attack land-based targets or aircraft, so it is useless unless the opponent builds any sea units, and while it is normally invisible except when surfacing to attack, it can be detected by destroyers and gunboats. When heavily damaged, it is not able to submerge. The Soviet secret weapon is the Iron curtain, a device that renders a selected unit invulnerable to attacks for a short period of time. In multiplayer and skirmish modes, they have access to two of the Allied side's infantry: the Rocket Soldier and Tanya Adams, a commando capable of easily killing infantry and destroying structures. They also have a wide selection of air units for assault (MiG-27, Yak-7 and Mi-24 Hind) and map revelation through spy planes, and could deploy infantry by air through paratroops or by the Chinook transport helicopter (the latter only present in multiplayer). The Soviet "tank rush" was a popular strategy online, involving building many heavy tanks and overwhelming the opponent with sheer numbers. The Allies' forces are generally cheaper, faster to build and more agile. Their minelayers can destroy enemy armour and their infantry can survive longer with good use of their medic unit. They are at a disadvantage on land, as the Allies' strongest tank (the Medium Tank) is still weaker than the Soviets' starting tank (the Heavy Tank) and has the same speed. The Allies have only one air unit (AH-64D Apache Longbow) compared to three Soviet units and their defences against a ground assault are much weaker. On the sea, the Allies possess an advantage in naval power thanks to the Cruiser, which has the longest-ranged and most powerful surface-to-surface attack in the game, and the destroyer, which is capable of adeptly taking on any type of unit type in the game - land, sea or air. The Allies' secret weapon is the Chronosphere, which temporarily relocates a selected unit to another part of the map. They also possess several other tools, such as stealing enemy resources, hiding their own units and structures, or revealing the game map with satellite technology. In online play and computer skirmish, Allied forces have access to the nuclear missile silo, an exclusive in the Soviets' single-player mode. 12 December 1995 - Westwood Studios started creating a real-time strategy game set in the Second World War. The name is still unknown. 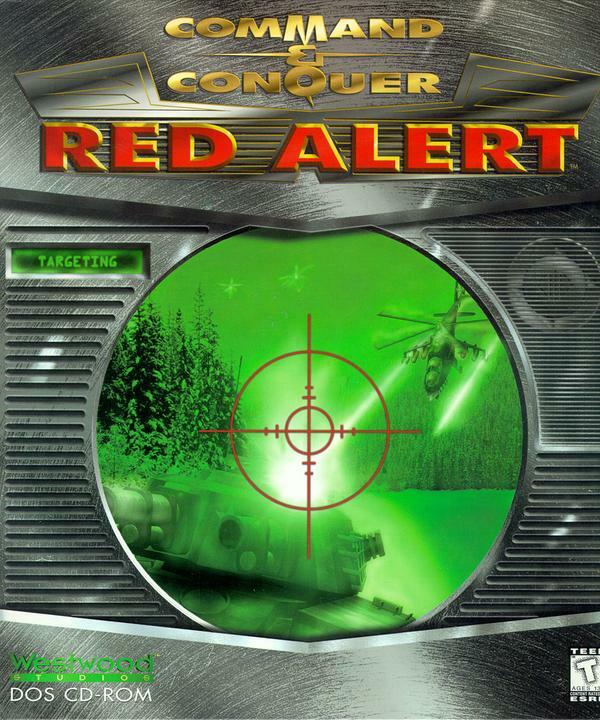 29 January 1996 - The newly named Command & Conquer: Red Alert begins experimental development on Windows 95. 11 February 1996 - Story drafts completed, great new units and buildings announced. 1 March 1996 - Development for DOS and Windows 95 accelerates. 80% of the engine and 25% of the artwork and graphics are done. 15 March 1996 - Multiplayer capacity increased from 4 to 6. 17 May 1996 - Multiplayer capacity increased from 6 to 8. 27 June 1996 - Westwood Studios focuses development on creating a multiplayer environment on the Internet. 1 September 1996 - Testing of DOS and Windows 95 versions started. Tester count increased from 10 to 60. 5 September 1996 - Westwood Studios announces the game to be released in 45 days. 4 November 1996 - PC Gamer releases "secret" information and never before seen images from the game. 9 November 1996 - First CDs created. Bug hunting becomes a priority. 12 November 1996 - The game malfunctions on some systems. 14 November 1996 - First master discs manufactured. Final testing phase started. 17 November 1996 (7:00 AM PDT) - Master discs sent for copying, ending the development cycle of the game. 22 November 1996 - Game released in North America. Command & Conquer: Red Alert takes place during an unspecified period in the 1950s of a parallel universe, which was inadvertently created by Albert Einstein in a failed attempt to prevent the horrors of World War II. Starting off in 1946, at the Trinity site in New Mexico, the opening to Red Alert shows Albert Einstein as he is preparing to travel backwards through space and time. After his experimental "Chronosphere" device is activated, he finds himself in Landsberg, Germany, in the year 1924, where he meets a young Adolf Hitler just after the latter's release from Landsberg Prison. Following a brief conversation between the two, Einstein shakes Hitler's hand, with this somehow eliminating the man's existence from time and returning Einstein to his point of origin. Following the destruction of the Soviet stronghold, an Allied infantry squad discovers Stalin buried alive in the rubble. As they begin to remove the debris from the fallen leader, General Stavros stops them. He "convinces" them that they 'saw nothing' before they leave. Stavros then stuffs a handkerchief down Stalin's mouth before covering his head with a large stone and walking away. The original Red Alert can be seen as the Genesis of both 'Red Alert' and 'Tiberium Universe' timelines. Allied victory is confirmed to be the canonical ending and it leads towards the events in Tiberian Dawn and the re-emergence of the Brotherhood of Nod in 1995. Alternatively, it can lead to the events of Red Alert 2 and Red Alert 3, though this should be accepted as yet another alternative timeline. As the Soviets celebrate their victory in the newly-captured Buckingham Palace, Stalin commends the Commander for a job well done while drinking a cup of tea, only to suddenly realize the tea has been poisoned by Nadia. A disgruntled Nadia proceeds to gun him down as the poison overcomes his body. Following Stalin's death, Nadia tells the Commander that the Soviet Union is now under the rule of the Brotherhood of Nod, but is then betrayed and shot in the back by Kane, who reveals himself to be the true mastermind. This is the non-canonical ending to the Red Alert series. Tanya Adams, a special ops. Commando. Played by Lynne Litteer. Professor Albert Einstein, German physicist. Played by John Milford. General Gradenko, Soviet commander. Played by Alan Terry. The image seen at the conclusion of Red Alert's installation in Windows 95. The quote is adapted from a quote in George Orwell's novel 1984.
goals of the Brotherhood of Nod. Indeed, Nadia, the head of the NKVD, Stalin's mistress and evidently a secretive member of the Brotherhood herself as early as the 1950s, instructs the player to "keep the peace" until Nod would "tire of the USSR in the early 1990s" upon the campaign's successful conclusion. Kane however shoots her without warning, and proclaims to the player that he "[is] the future". Moreover, during the fifth cutscene of the Allied campaign, a news announcer reporting on the Allies' loss of Greece is suddenly heard stating that the United Nations are in the process of bringing about a unique military task force aimed at preventing future globalized conflicts. This task force is heavily implied to have been "Special Operations Group Echo: Black Ops 9"—the covert and international peace enforcing unit of the United Nations and the precursor of the Global Defense Initiative, one of the two main and iconic factions of the Tiberian series alongside the Brotherhood of Nod. A much debated theory intended to resolve the apparent timeline error which came to exist between Command & Conquer and Red Alert 2 is to consider Red Alert as the genesis of two parallel storylines. If the Soviet campaign were to be completed in Red Alert, the USSR would emerge as the dominant Eurasian power and Kane and the Brotherhood of Nod would subsequently take control of this new empire. Conversely, if the Allied campaign were to be completed, the Allies would emerge victorious and the timeline would instead lead into the events of Red Alert 2 (though Red Alert 2 completely ignores anything that could connect it to the Tiberium timeline). According to former C&C designer Adam Isgreen, however, Tiberian Dawn in fact follows on the conclusion of Red Alert's Allies campaign, while Red Alert 2 and Yuri's Revenge take place in a second parallel universe, created by a new attempt to alter history in "Incursion", the working title of Westwood Studios' cancelled version of Command & Conquer 3. Isgreen also implied that Nikola Tesla may have been responsible for inadvertently having attracted the attention of the Scrin through his experiments, and thus for the arrival of Tiberium on Earth. An alternate way of connecting the two universes was through one of the drafts of the Renegade 2 storyline, but the two games were cancelled in 2003. Due to several references by Westwood, EA and Red Alert itself, this wiki regards the Tiberium and Red Alert universes as separate, but with identical timelines and events until the divergence some time after Red Alert 1. Therefore, the Red Alert 1 Allied campaign is considered canonical in both universes. Command & Conquer: Red Alert can be directly installed on Windows XP, Vista and 7. However, upon the first installation attempt the installer notifies that "Red Alert can only be installed on Windows 95" if an installation is attempted on either of the two operating systems. It is possible to install the game with the assistance of the Red Alert Manager, a program that manages the installation, program updates and Vista compatibility in one easy installation. The Red Alert Terrain Editor also has compatibility issues on newer operating systems. In order to successfully run this program under Windows XP, Vista or 7, the program's executable file needs to be configured to run under Windows 95 or Windows 98 compatibility mode. This will allow the program to operate smoothly under the Windows Vista OS. One sure and easy way to install the game is by downloading one of the Red Alert packages linked in the Freeware release section of this article. It however, also remains possible to manually install the game and its expansion packs, by running Red Alert's executables in Windows 95/98 compatibility mode, and by replacing the thipx32.dll file which the game installs within its main directory with an version. On the other hand, EA Games had released Command & Conquer: The First Decade on two dual-layer DVDs which consists of all of the C&C games up to and including Generals and its expansion, Zero Hour. It is, however, possible to install the DOS version of the game by setting the setup in Windows 95 compatibility mode and then running it under a MS-DOS environment. The TFD version of Red Alert does not include the Counterstrike and Aftermath soundtrack additions. Red Alert and its expansions were also part of Command & Conquer: The Ultimate Collection, a digital download compilation of all Command & Conquer games developed by 2010 (excluding Sole Survivor). All versions of Red Alert, as well as the demo, are rated gold in Wine  and are marked as "supported" in DOSBox. Installation instructions for Linux and installation instructions for Mac can be found on the PortableRA site. Command & Conquer: Red Alert is recognized as many gamers' first real time strategy game ever played online. Westwood Chat was supported up until 1996, when Mplayer.com was the dominant Multiplayer gaming platform. Mplayer hosted hundreds of thousands of online gamers until 2001 when Gamespy purchased the player. Red Alert online gameplay was supported by many different multiplayer platforms such as Kali, Westwood, GameSpy, TEN, Mplayer and Heat. A few years ago the game was mostly played on Tunngle, Kali, Westwood Chat (now hosted by XWIS), CGA (China only). Today, CnCNet is the preferred way to play online. To mark the 13th anniversary of Command and Conquer and the announcement of Red Alert 3, EA has released Command and Conquer: Red Alert as freeware in 2008. Alternative Red Alert 1 game packages can be downloaded from redalert1.com FunkyFr3sh's website and the PortableRA website. These easy to use installer packages come with the game plus expansions, fully patched along with some feature additions and bugfixes, CnC-DDraw to modernize the game's rendering system, CnCNet (the preferred way to play online), a simple launcher, a configuration tool and a few minor optional addons (such as The Lost Files movies and extra/unreleased music). There were two expansion packs released for Red Alert: Counterstrike and The Aftermath, both released in 1997. A cited difficulty with the add-ons is that both of them share a single list in the game menu, with Counterstrike's missions excluded unless its disc is in use prior to opening the menu. This issue is fixed with the beta patch v3.03, which separates the single "New Missions" list into two lists, one for each expansion. On August 28, 1998, Westwood Studios released Red Alert Retaliation for the PlayStation, a compilation of the two PC expansion packs, including the secret Ant Missions. It is almost identical to the PS port of the original Red Alert, except it introduced some new units like Tesla Tank, Shock Trooper, Chrono Tank and Mechanic, and included 105 multiplayer maps. Gameplay also included an in-game sidebar code called Soylent Green Mode. In this mode all ore fields turn to people/civilians, and ore trucks harvest them with grisly sound effects. Retaliation includes the music tracks that were featured in Counterstrike, Aftermath and Sole Survivor. It also included 19 exclusive briefing FMV (full-motion video) clips that were not in any of the PC expansion packs, which had none; all of them are shown when the player either starts to play through the operational theatre from the beginning or when all the missions of the theatre are accomplished; in other cases, the briefing text is shown. The FMVs had a general (for both sides) telling the player the mission objectives. The Allied General was general Carville who would later appear in Red Alert 2 and Yuri's Revenge; the Soviet General, Topolov, makes no further appearances in the Red Alert series. The Retaliation videos are available for the PC Red Alert in the Nyerguds' modification Red Alert: The Lost Files. This modification adds the Retaliation videos to the Counterstrike and Aftermath missions. It requires Red Alert patch v3.03 or Red Alert patch v3.03 for TFD (for the Red Alert version of the C&C The First Decade package). Retaliation was released as a download for PSP and PS3 from the PlayStation Network in Europe on December 4, 2008. OpenRA showing a Red Alert 3-styled tabbed menu, some changes to balancing/tech tree and new Mobile Flak unit. OpenRA is an actively developed modern cross-platform reimplementation of the engine that runs Red Alert, Tiberian Dawn and Dune 2000 as mods. The interface is updated and the gameplay altered for balanced multiplayer matches. Some graphics are updated and new units are added. It is easy to create own mods. A similiar project in very early stages of development is Red Horizon, which tries to create tools and a game engine for legacy 2D Westwood RTS in Java. There is a fan project called FreeRA which aims to be a clone that runs only on Linux, with development stalled in 2008. OpenRedAlert was a project based on FreeRA which stopped development in 2010. Retouched images with enhanced explosions, grey ships and a Tiberian Dawn Communications center. A mix of technology shown on an Allied sidebar, and blue gems as ore. This is the only known full quality screenshot with RA1 icons without text on them. ↑ Westwood Studios (1996-11-22). Software Retailers on full alert as Westwood Studios' Red Alert Ships (Archive.org). Westwood Studios. Retrieved on 1 November 2016. ↑ 3.0 3.1 Westwood Studios (1997-10-24). Westwood Studios Official Command & Conquer: Red Alert FAQ List. Westwood Studios. Retrieved on April 23, 2007. ↑ 4.0 4.1 Westwood Studios (1998-10-23). Official Command & Conquer FAQ v3.0. Retrieved on 2007-05-13. ↑ 5.0 5.1 Westwood Studios (1998-10-23). Official Command & Conquer Gold FAQ v1.3. Retrieved on 2007-05-13. ↑ 6.0 6.1 Kane's Dossier. EA Games, Command and Conquer 3 official website (2006-10-29). Retrieved on January 20, 2007. ↑ Download Red Alert for free!. EA Games. Retrieved on 2008-08-31. ↑ Adam Isgreen (2006-10-17). C&C Story. Petroglyph Games. Retrieved on 2007-08-23. ↑ Adam Isgreen (2006-12-18). C&C Timeline (ii). Petroglyph Games. Retrieved on 2007-08-23. ↑ Adam Isgreen (2006-12-18). C&C Timeline (i). Petroglyph Games. Retrieved on 2007-08-23. ↑ Adam Isgreen (2006-12-21). C&C Timeline (iii). Petroglyph Games. Retrieved on 2007-08-23. ↑ Kane's Dossier. EA Games, Command and Conquer 3 official website (2006-10-29). Retrieved on January 20, 2007. ↑ Frank Klepacki. COMMENTARY: Behind the Red Alert Soundtrack. frankklepacki.com. Retrieved on July 27, 2006.